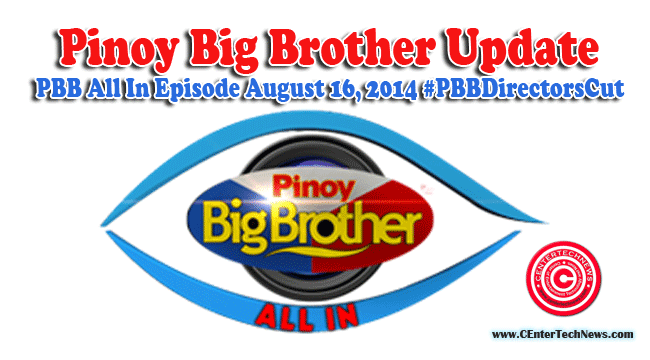 Pinoy Big Brother Update: PBB All In Episode August 16, 2014: Things are really getting tougher as the housemates have reached the 105th day inside the PBB House. The August 16, 2014 episode of Pinoy Big Brother All In was the conclusion of the weekly task of the housemates to undergo acting training with award-winning directory Cathy Garcia – Molina. The housemates were stretched to the limit and until the very last day of their training, they were able to go through the strict compliance with the requirements of the director. The Saturday episode of the Pinoy Big Brother All In was able to show to the people what the housemates went through for the entire week with their product called “The Endless” on a Worldwide Free TV Premiere. The director commented on each and every acting style of the housemate. When she was able to see lots of mistakes by the housemates, she was able to say “are we gonna shoot until evening?” which meant that they were repeating all over again and they were not able to finish anything. Big Brother talked to the director from time to time to know the improvement of the housemates and for the comments of the director to them. The director said to Big Brother that she was the one who was getting the punishment with the performance of the housemates. This made the housemates more and more challenged. Each of them wanted to give up but they shouldn’t. But then despite what happened, in the end, the director still showed her concern to the housemates. She considered working with the housemates as one of the most memorable part of her life. The director explained that she wanted the housemates to know what exactly the life that lies ahead of them. The director bid goodbye to the housemates and she almost cried. She was such a caring person that is why she wanted to housemates to improve in their skills in acting. She did a great mission inside the PBB House that the housemates will also cherish. Well, hats off to director Cathy Garcia – Molina.